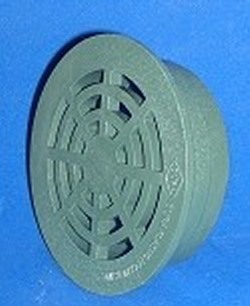 3" Atrium Grate, Green. Will fit most all 4" pipes (sch 40/80, irrigation, SDR, belled end, Class 200, corrugated, etc.) and/or fittings. A loose fit. You will need to silicone or screw it into place. Basically just sits on the top of the pipe or fitting. Made in the U.S.A.